Yamaha Motor JW Wheelchairs Division Acquires "ISO 13485: 2003" - International standard for quality assurance on medical equipment - - News Releases | Yamaha Motor Co., Ltd.
IWATA, March 1, 2017 - Yamaha Motor Co., Ltd. (Tokyo: 7272) announced today that the JW Business Division, which works with electric power units for wheelchairs and electric wheelchairs etc., has acquired certification for the international standard "ISO 13485: 2003*1” for quality management systems in the medical equipment field. 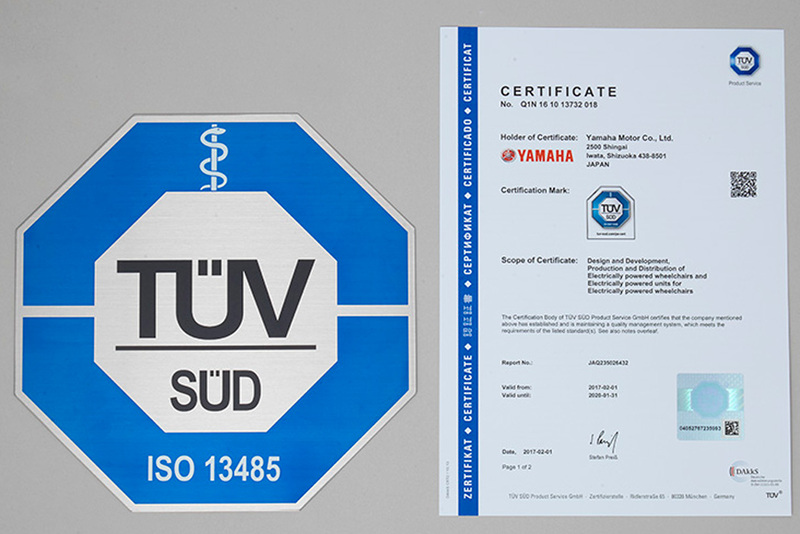 This certification was assessed by the "TÜV SÜD*2" - headquartered in Germany, and has the scope of coverage being all divisions such as development, manufacturing, sales, service, quality assurance and procurement at JW Business Division. The JW Business Division continues its work not only in finished products, but also in all facets of quality improvements from the product development stage to production, sales and after-sales services. By acquiring the "ISO 13485: 2003" certification, JW 's quality management system was recognized as able to meet the high quality requirements demanded for medical equipment. The acquisition of the "ISO 13485" is a first for the company. In 1995, the company released the JW - I, a unit that works to supply electrical power to manual wheelchairs as part of our response to the health and welfare field, along with aging societies. Since then, we have applied Yamaha Motor’s proprietary advanced control/drive technology to provide electric wheelchair products - in the pursuit of lessening the burden on caregivers - in addition to the comfort and convenience of users. This has worked to help the company continue to maintain its top-share in the basic electric wheelchair market. * 1. ISO 13485: 2003 was created based on the ISO 9001: 2000 (International Standard for Quality Management Systems) and has been modified so that the regulatory requirements for medical devices can be easily incorporated. This will now become the standard for the international ISO for quality management systems of medical equipment.